Well its been a few months since my last post, and i been needing to update things. Basically i am creating the Huxley MD (My Design) reprap machine with my machine, and also started to make a stepper struder for my makerbot – running mk5! so there has been lots to talk about. After heading to the makerfaire in nottingham, i spoke to jeanmarc of emaker shop, and saw the small huxley he was making, i liked it, and wanted to make it. I didnt like the design for the extruder, and i wanted a more recognisable extruder that has been used, therefore i wanted to use the makergear hot end. Also i wanted to use different bearings, lm6uu for 6mm rods. I designed the parts and a picture will be put here, but there are flickr pictures! I also have bought some angel eyes from ebay to fit onto my makerbot and reprap – 90mm and 50mm diameter lights! VERY nice and a recommendation to all! 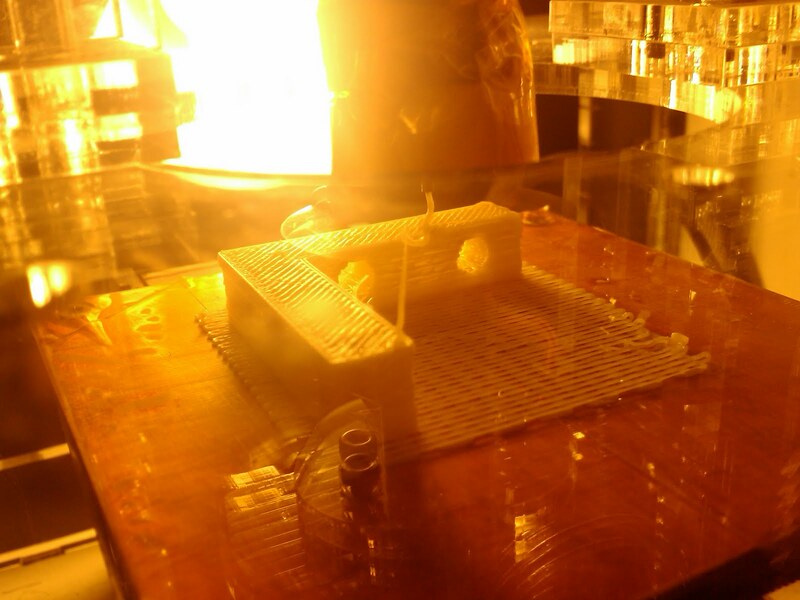 Looking at stewarts build, the stepper motor design makes FAR better quality prints! anyways, im also trying to design a heat bed for the huxley 140mm by 140mm so that Jeanmarc can use them on his emakers he is selling, and i can have one for myself! sadly the etch tank has become too full of copper, and therefore i need to dispose of it and start with a fresh ammount of acid. This is a complex process involving taking the chemical to a hazardous waste recycling facility! and costs! anyways, thats a brief summary of whats been going on. Oh and i got woodworm in my room, so im hoping its not going to the makerbot!!! yay! dont you just love payday! well, pay day is upon us, well its been a few days and aftre sorting out all my other bits ni need to buy, i decieded to put money towards a mk5 and a few other bit and pieces for the makerbot… so putting in my order, i am dreading the cost of uk import tax… estimate it to be about £50 so when it comes i will let you know, but… it has been ordered! for some reason i cant add a pic… but the total cost was $259.70, thats about £158. we shall see! its been shipped along with some timing belts to replace the ones i have originally, they were open ended belts glued together with wet suit glue so will eventully break! So, here it is… as im designing a shell for use in a project, which needs to be completed by Wednesday… for the MCM expo! Yes the MCM expo in london next weekend, i go to use my makerbot, and sadly the Z axis starts playing up… then a wiff, snap crackle and pop (and no mini cartoon characters to see for miles) the stepper motor controller decieds to frazzle. Well its been an eventfull couple of weeks. firtly i decieded to change my usb ttl adapter for the makerbot to a 5v logic level, as apposed tothe 3.3v logic level one i was using. the idea behind this was that the switchover signal voltage could have been too low and therefore meant the data was not being sent at good quality. I was annoyed when i bought the first cable, as i was thinking it was a 5v level cable, but alas… oh well. the first tests came as i was setting up the uni makerbot for a demo of high calibre… more on that in a sec, but i managed to start repg and the new software version, meaning i could import and manipulate the files stl etc in repg. anyhow, i printed these with great success, installed the wob arr and set to print something more complex. The gear set, recently uploaded seemd lie the perfetc vhoice. the results seemed ok, but the thinner smaller gear had to be height adjusted as too much plastic was comming out causing lumps. – this maybe because there wasnt enough time to cool befre the heater nozel came ploughing through, so need to work on ‘cool’ settings as mentioned in recent blog post elsewhere – should really write the links down!. 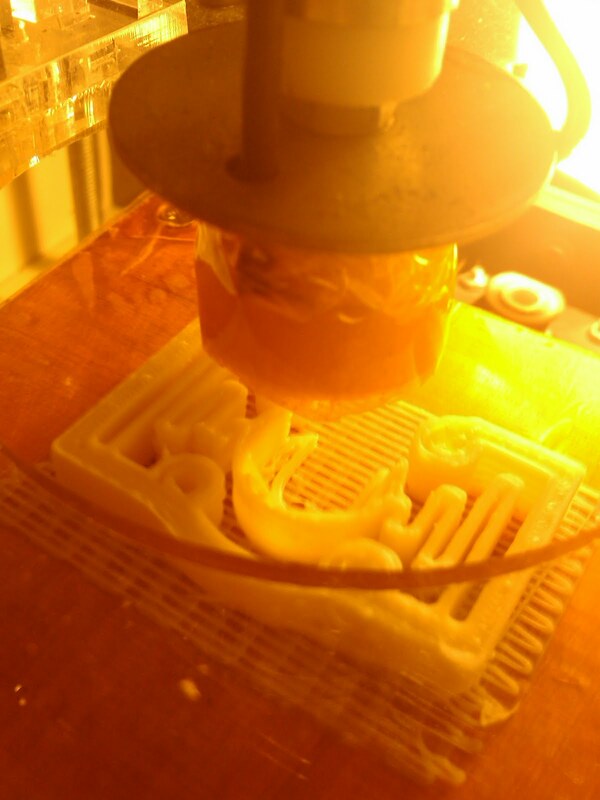 need to adjust speed and extruder flow rate too, both adjust this issue. with the wobble arrester installed, i made the gears. Am trying to get my web cam to broadcast from my makerbot – what im going to do is have the pc running in the makerbot, which will be connected wirelessly to my router. It will be running WEBCAMXP5 (or other software thats better) which will send videos from 2 cameras inside my makerbot. One camera will be on the nozzel so you can watch it squirting, the second will have an overall view of the makeing board. This way, i will try and make a program that can take uploads of stl files, and then produce it, so in theory i can send a file from work, and watch it being made – maybe something i can open up to the world? those who need white paint or black, or grey… and in uk, Poundland sell spraypaint and its only £1 and it gives great results, esp the black! I sold my ibooks and ipod touch to fund my maker bot and so far its looking great. I painted the bearing brackets – and got accused of escaping from a mental hospital by the police whilst i was doing so… haha, i also painted the insides white, with the view of using some RGB leds to make it colourful… or just red… but the outside… i dont know what colour – any suggestions? Makerbot, my plans for making one, and the first step! Hi all, and welcome to my blog. The reason why i wanted to create this blog was to document my build of my own cnc MakerBot, which im hopefuklly going to build on my own, without buying much from the makerbot stores. I have access to a laser cutter and machinery at university, so i thoought i would have a go. The first bits i have got are the plywood sheets from a local timber shop, so i bought 6mm (to be made down to 5mm at the joins) and 3.18mm plywood, for the x and y stages. I have also bought the m8 screw threads for the z axis. It has been a slow start but i have been looking forward to building a 3d printer for a while. The Reprap started me off, and the ability to make and construct things such as animatronic head and the facial features. Also having the ability to make the circuits required for this MakerBot, i feel i can make it cheapwer than the costs given, as i have the facilities.